Joe Said So: Techie Tip: Send Text Messages for Free Via E-Mail! Techie Tip: Send Text Messages for Free Via E-Mail! Here's a fun tidbit that most people don't know. You can send text messages for free via e-mail. That's right, every cell phone is actually assigned an e-mail address based on the service provider. All you need to know your friend's phone number and who they pay every month. Simply substitute the #'s with your friend's digits and you're good to go! If you're a Gmail user, you can also send text messages via chat as long as you have your contact's phone number in your address book. 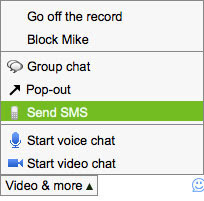 Simply click on the "Video & more" button and select "Send SMS". Voila. Free text messages via IM! Joe Says: While sending text messages via e-mail is free for you, be considerate of the person on the receiving end. Not everyone has an unlimited text messaging plan and the recipient may be charged per message.